She has almost adjusted to the quiet now, almost adjusted to not having to wake up twice a night for feedings. She works long hours at Quantico, ignoring the gnawing hunger in her stomach and the persistent throb behind her right temple. She leaves home before dark, leaves work after the sun has long disappeared from the horizon. The schedule means that there is just enough time for a shower before falling into bed. In the morning, she does it all over again. She thinks if she moves quickly, she'll avoid the empty spaces in her life and more importantly, she'll be too busy to miss the labels she's embraced over the last year or so -- those of lover and mother. She keeps in constant motion because then she won't have time to stop and think that she's spent nearly a decade of her life chasing after a white whale. She doesn't want to think that after all of her adventures, she has lost nearly everyone who has meant something to her: her sister, her lover, her son and God, even her dog. Occasionally, it occurs to her she's now only one person away from being completely alone. Scully looks up from the autopsy reports she's been going through. Liza stands in the doorway, her hand clutching the leather strap of her purse tightly. "We're going to lunch, Dr. Scully," Liza says brightly. "We thought you might want to join us." "No, not today." Scully manages a wane smile. The lunch invitations have been coming more frequently these days, but she's not yet ready. She feels bad about turning Liza down every day, considering the other woman's heart is in the right place. "But thank you for asking." Scully nods. "Please. Go ahead. I have some things to catch up on here." She indicates the piles of manila folders and stacks of paper crowding the top of her desk. She has a flash of memory, of the basement office and the desk that never ever seemed to emerge beneath various case files, video tapes, slide shows, and conspiracy theory magazines. "But thank you for asking, Liza." She smiles briefly. Liza nods and gently closes the door behind her. 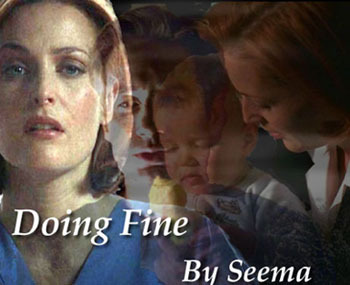 Scully puts her hands to her face, tried to rub the weariness out of her eyes, and then turns back to her work. After a few minutes, she rises from her chair to pace the length of her office a few times, before stopping in front of the window. It is a beautiful day outside -- perfect blue skies and just the hint of a breeze in the air. The carefully manicured lawns of Quantico are alternately striped in two shades of green and the flower beds have been newly planted over the weekend. She missed the blooming of the dogwoods because of an X-File which took her out to Lubbock. But still, she can find beauty in the trees lining the various roadways leading into the Quantico campus. She presses her hand against the cool glass for a moment before returning to her desk. The mountain of paperwork seems immense, but unavoidable. And for the first time in many months, she wishes she was out chasing after ghosts and Satanists. She allows herself a small smile of nostalgia -- *those* were the days. The phone rings, abruptly jolting her out of her thoughts. She moves almost mechanically. "Agent Scully, it's John Doggett." She holds the phone tightly, trying to push away the overwhelming sense of disappointment she feel every time the phone rang and it isn't Mulder; she wonders if she'll ever stop waiting to hear his voice. "Yes, Agent Doggett, how are you?" "I know it's late, Dana, but Monica and I'd appreciate it if we could stop by tonight. How about around nine?" His voice sounds scratchy over the line, cutting in and out. Scully can hear voices in the background and speculates Doggett is in a shopping mall of some kind; cell phone reception always seems spotty in those cavernous cement monuments to capitalism. Scully almost says something about the baby going to bed at seven but then catches herself. She plays with the pencil on her desk and says automatically, "That will be fine." Idly she draws circles, several of them in a row, on her yellow legal pad. "It's an X-File of sorts. At least Monica thinks so. I'm not so sure. We could really use your opinion." She stares at her legal pad, the circles blurring in front of her eyes. She knows she should ask for more details, but she feels suddenly tired. "All right. I'll see you at nine then." "Yeah?" It's impossible to keep the sharpness out of her voice. "What is it?" "Just wanted to check in. See if you were doing okay." "I'm doing fine, Agent Doggett." Scully inhales sharply. "I'll see you at nine." As she hangs up the phone, she hears voices out in the hallway. She strains to hear. Students or faculty? She can't quite tell. As she stands up to check, the edge of her lab coat catches the reports on the edge of the desk, knocking them to the floor. As she leans over to gather them up, her elbow knocks over a stack of folders. Scully sits on the floor, closes her eyes, taking a deep breath. "No," she whispers as she gets on her knees to start picking up the mess. "No, no, no." She stops, presses her hand to her face. How often has this happened to her in the last two years? Ever since she lost Mulder, ever since she found him again, only to lose him all over again. It's hard to stifle the sob caught in her throat or stop the moisture gathering in her eyes. She doesn't care about the files, she never has, she realizes. It's the man she wants, the man and the son she made with him. There's a knock on the door and without waiting for a response, the department secretary -- Leigh -- pushes it open. "Dr. Scully, are you all right? I heard a noise." Scully doesn't look up. "It's nothing, Leigh. I was just a little clumsy." She pauses, groping for the right words but finally falls back on her tried and true standard, the words she seems to utter a million and one times a day. "I'm fine." "Do you need any help?" There's concern underlying Leigh's voice. "You do have a class to teach in less than an hour." It's only then Scully notices some of the papers have slipped out of their folders, that some of the files have intermingled with her close notes and Leigh's right -- it will take time to sort them out. She smiles tightly at Leigh and shakes her head. "I've got it under control. Thank you." Methodically, Scully starts gathering up the files. Most of these are related to her class syllabi, a few concern some of her students. There are a couple of autopsy reports on some ongoing investigations, both X-Files and non-X-Files. She doesn't pay particular attention to the photograph of Mulder holding William which slips out of one folder; she just puts it back in the folder and continues on. She hasn't changed the CD in her car for several weeks now. There was a time when she had nursery rhymes on repeat, and one day, she came into work humming "Mary Had a Little Lamb" under her breath. That was when she changed the CD to a 60s' compilation and discovered her son had a special liking for Three Dog Night's "Joy to the World" -- the exact opposite reaction Mulder had had when she'd sung that song to him in the woods of western Florida. Perhaps the difference was in the way she drew out the vowels in the word 'fishes' or the way she tickled William when she sang "All the boys and girls." He would laugh, his eyes -- the reflection of her own -- crinkling in merriment. "Joy to you and me," she would tell him over and over again. She meant every word. She packed the CD with William's things. "Make sure he hears it at least once day," she told the social worker as she put the last of William's bags into the car. And then taking a deep breath, she put William in the car seat, her lower lip trembling. "Joy to you and me," she whispered. "Joy--" she stopped then. Stood up straight, smoothed her skirt. Looked at the social worker. "Make sure," she said, her voice surprisingly strong. "He really likes that song." The social worker promised. Scully stood on the doorstep watching the red Dodge Caravan disappear around the corner. Her fingers tightened around the stair railing and her throat felt raspy. Reyes gave her the CD Scully listens to now on endless repeat -- George Winston, Reyes said, a New Age pianist, try him, you'll like him. 'Like' might be a strong word, but Scully endures the music because Winston is new to her, and his music is soft, easily absorbed, not at all jarring; most of all, it is unencumbered, untainted by memory. And so after the first time she listened, she left the CD in the car, never changing it or turning it off. It pleases Reyes when Scully tells her this. Scully arrives home just a few minutes before eight, making a genuine effort to be there and ready for Doggett and Reyes. Holding Chinese food in one hand, briefcase in the other, and purse over one shoulder, she nudges the door open with her shoulder and then dumps the whole mess -- with the exception of the food -- on the floor. She wonders how in the past she'd managed with the baby stroller. Jolting herself back to the present, she sits down on the sofa, kicks off her shoes, and chews mechanically through her pan fried noodles tossed with chicken and vegetables. Some of the sauce trickles down her chin, and drips onto her blue blouse. She waits until after she's finished eating to change her shirt. She roams listlessly through the apartment, picking up a sweater here, throwing out some newspapers there. She is aware of the lack of energy and purpose in her step. Every now and then she looks up at the clock. Has time always moved this slowly? She stands in front of her CD collection, running her finger over the selections. She flips through the channels on her television, and finds nothing of interest. She sees the light blinking on her answering machine and leans over to press the play button. "Dana, it's Mom. Call me. Please. We need to talk." Yes, Scully thinks, yes they do. Her mother still hasn't accepted what has happened, doesn't quite understand either, and Scully isn't in any mood to discuss this anymore. What's done is done and she cannot go back. She accepts this even though the decision still wakes her in the middle of the night. Like she used to envision what Mulder's life sans her and William was like, she now imagines life for William. The social worker told her the adoptive family was so thrilled, so happy, to have William. "They are good people, Dr. Scully," the social worker said. "Stable, warm, loving. William will be happy with them." "And safe?" Scully's voice cracked slightly. The social worker looked at her oddly. "Yes, of course. Safe. Very safe. We wouldn't have placed William with the Van der Kamps if we hadn't thought he would be safe with them. I assure you, Dr. Scully, we did a complete home evaluation and there's no doubt in our minds William will be happy and safe." The social worker stressed each reiteration of the word 'safe' as if Scully were a small child. Scully focused her watery gaze on a point beyond the social worker. She wanted to explain the situation, but how could she possibly? How would this woman in her trim tweed suit and sensible blue shoes understand super soldiers or black oil? Or that there was a vast government cover-up in place, that men at the very highest levels of the federal government had conspired with alien beings to colonize Earth in the distant future? So Scully said nothing, only thanked the social worker and said good-bye; she had asked that there be no further contact regarding William. She did not want to risk her son's safety by attempting to keep in touch. Now, as she moves about her apartment, she keeps noticing the things that are missing. The laundry basket of toys in this corner, the box of diapers, the piles of soft pastel-colored fleece blankets, the bassinet, the stuffed animals -- the list goes on and on. Scully sinks onto the sofa, pulls her knees up to her chest. She presses her cheek to the side of the sofa, her eyes fixed firmly on the clock. Mulder wasn't paying attention when she took the picture of him with his son. He was standing in her living room, William all of two days old, cradled in his arms. Mulder was counting toes, examining fingers, kissing eyelids, asking "When are you going to do your old man proud and grow some hair?" Scully had stood off to the center, the camera tight in her hands. She couldn't speak. The suitcases were to her right -- there was almost no place left to walk in the living room -- and she resisted the impulse to ask Mulder if he had packed everything he needed. And damn. Four suitcases. Four *large* suitcases. How the hell was he supposed to make a smooth, secret getaway with so much goddamn stuff? But she bit back the bitterness and sadness to watch Mulder standing by the window. Mulder with William, and the morning light streaming through the blinds which seemed to slant and twist around the two of them. "Hey Scully, look at his little frog feet," Mulder called to her. He offered her his crooked smile, and she memorized the way his eyes crinkled upwards at the corner. Later, she would realize that William's smile was an echo of Mulder's. "Are you calling our baby a frog?" The word 'our' sounded foreign on her tongue. She knew she would never get the chance to get used to it. "Frog-*man*," Mulder corrected gently. "He's a little frog man. William *Frogman*--" he paused "-- Scully? Right?" She didn't answer immediately. This wasn't the time for that conversation, she knew. After so many months of keeping the identity of William's father close to her heart, she wasn't yet ready to let that knowledge out for public consumption. But looking across the room at Mulder that day, the way he held William so carefully in his arms, she shook her head. Whether he saw the gesture, she still doesn't know, but one day, she thought, one day she'd make the name change official on the birth certificate. "It depends. Are you really going to call him Frogman?" Scully asked. She kept her tone casual, almost amused-sounding. She refused to let her emotions get the better of her. Not then, not in those last moments, and sometimes now, she berates herself for losing control -- for sinking into a constant state of teary-eyed, teary-voiced being. "There is precedent, Scully. *Royal* precedent. Queen Victoria said all babies resembled frogs until six months of age. She should know. She had nine tadpoles of her own." Mulder looked over his shoulder at Scully. "He has my nose, Dana." And that's when she took the picture. Mulder's lips pressed to his son's forehead, both of them oblivious to the woman who connected them. All told, she has only three or four pictures of Mulder with William. Perhaps -- even though she really did know better -- it's because she assumed there would be more time, something closer to forever rather than never. For a while too, she assumed Mulder's absence would be only for a month or two, and that he'd be back. His emails, at first, seemed to imply this. At first. She knows she needs to tell Mulder about William. Email seems like a cold way to break the news, but there's really no other way. Telephone calls can be traced, she knows, but damn, she's starting to forget what Mulder's voice sounds like. Every time she starts to write, she never gets past 'Dear Mulder.' Once again, words -- reduced in meaning by emotion -- elude her. She can't help the occasional burst of anger she feels towards the father of her child. Her feelings for Mulder are tempered by the fact he left her with a 48-hour old son, and that while he writes of missing her and William, he no longer talks of coming home. She stopped checking her e-mail on a minute-by-minute basis because his words lack credibility. A part of her believes if Mulder had been here, she wouldn't have had to give William up. This is irrational, she knows, but she has to lash out at someone. A phantom Mulder whose absence creates another grief she must live with is as good of a target as any. Doggett and Reyes are right on time. Nine on the dot. Scully wonders if they'd been sitting out front in the car, watching the clock as well. "Sorry about this," Doggett says. He always has that awkward look around Scully these days, a throwback to their early days of working together. It isn't lost on Scully that Doggett has developed an easy familiarity with Reyes, that he always seems comfortable and open with her. But Scully knows that that kind of empathetic camaraderie comes from years of work, built on mutual trust, respect and like. Scully also knows some things are once in a lifetime, that once lost can never be duplicated again. "No, no, it's fine. Come in," Scully says, stepping aside to let them in. Reyes murmurs a soft greeting as she passes Scully. "Can I get you something?" "No, thanks. We stopped at a Chinese restaurant on our way over," Reyes says. She sees the remnants of Scully's takeout in the trash. "So did you, it seems." Reyes hands a file over to Scully. "Take a look." The file feels light in Scully's hand. "Have a seat." She gestures to the sofa. "Please. Make yourself comfortable." Doggett and Reyes sit on the sofa, while Scully settles in the armchair, balancing the file folder on her lap. There isn't much to look at, just a few scribbled notes in Reyes' disjointed handwriting and a single photograph of a blond woman in her early thirties. Scully looks over at her erstwhile partners. "What's this all about?" "The woman, Maureen Hannigan, claims to be an abductee," Reyes begins. "About six months ago, she reported the feeling of being choked and suffocated, that she could feel someone sitting on her chest, and a ringing sensation in her ears." "And let me guess, she heard voices and banging on the walls and could see shadowy figures at the foot of her bed," Scully says. She shifts in her seat slightly. "Well, yes," Reyes says. "You're familiar with this case?" "Agent Reyes, there is no X-File here." Scully takes a deep breath. "What you're describing is consistent with the diagnosis of sleep paralysis: the inability to perform voluntary movements either at hypnogogic or predormital form or upon hypnopompic or postdormtal form. Along with paralysis of the limbs, symptoms can also include hypnagogic hallucinations or dream-like mentation, which is why many sufferers of sleep paralysis believe that they have been abducted by aliens." "Usually I'd agree with your conclusion, Agent Scully," Reyes says, "but for one complicating factor." "Eight days ago, Mrs. Hannigan disappeared." Doggett stares intently at Scully. Scully examines the photograph. Hannigan's features are sharp and distinct, her hair strictly coiffed and what little Scully can see of her blouse is crisp and professional -- not a typical image of someone claiming alien abduction. But then again, Dana Scully, until seven years previously, wouldn't have fit that profile either. Scully narrows her eyes as she focuses even more on the photo. "Who reported her missing?" Scully finally asks. "And you believe her when she says she's been abducted by aliens," Scully says shortly. Doggett and Reyes exchange looks. Scully notices their knees knocking together, that Reyes leans close to Doggett, a shoulder to shoulder brush. "Well? Do you?" Reyes shifts uncomfortably in her chair. "Not any more. She's been found." Scully closes the folder. "And?" She doesn't bother disguising the impatience in her voice. "She was found in a fugue state in a swamp about two miles from her home, dressed in sweat pants and she had some minor bruises and scratches. She did not appear to be harmed in any other way," Doggett says. "No one saw her in the area prior to her discovery nor did any nearby surveillance video cameras pick up anything. Mrs. Hannigan herself doesn't know how she ended up in the swamp. She only remembers bright lights and voices." He shifts his position slightly so that his knee once again touches Reyes'. Reyes doesn't seem to notice. "She almost died, Scully, but now attributes her survival to a Nurse Owen, a nurse who is unknown to the rest of the hospital staff." Scully stands up abruptly. "This sounds like a case for the police, not the FBI." She finds it difficult to breathe as she grabbed the back of the armchair for support. "Agent Doggett, this case is--" Scully pauses, trying to come up an appropriate explanation, but then gave up. While she shared the sketchy details of her abduction with Doggett, she'd never gone into particulars; she simply never saw the relevance in sharing the experience with him. "I can't help you. I'm sorry. Would you like some tea?" She doesn't wait for their response as she heads into the kitchen to put the kettle on. "Dana." Reyes follows her into the kitchen. "I understand what you're doing," Scully says softly. She doesn't look at Reyes. "I appreciate it, I do." "It's a real case, Dana, not a distraction. Maureen Hannigan's disappearance matches to those of three other women in Wichita during the past six months. And--" Reyes pauses "-- I did find some notes Mulder left on a case from 1994 that matches up with this one." Scully takes three mugs from the cabinet. "That was a long time ago," Scully says evenly, stepping aside to let Reyes retrieve the Tetley tea bags from the third shelf. "And Mulder wrote a lot of things and much of it was conjecture and speculation on his part." She bites her lip. "You can't possibly chase every single alien abduction report, Monica, you can't." Scully's hands tremble as she pours the boiling water into the mugs. "It becomes your life, it becomes you, it becomes all that you are, all that you will ever know and be. It happens so slowly, and then when you realize what has happened, it's too late to turn back." "Do you know how many times I've heard the exact same scenario you just spun me?" Scully reaches for the sugar. "I have little doubt that when you question Mrs. Hannigan, you will learn she is inclined to fantasy and that she has experienced apparition sightings." Almost absentmindedly, Scully spoons the sugar into the coffee. "Psychologically, her tale of abduction and her subsequent discovery in a swamp could be nothing more or less than a desire to relinquish control over her life, or conversely, it could be a manifestation of her own sense of powerlessness. Either way, it's not an X-File, Monica. Not one you or Agent Doggett should waste much more time on." Scully shakes her head. "There are many truths out there, Agent Reyes, some answers more easily obtainable than others. I suggest you choose wisely." Reyes puts her hand gently on Scully's arm. "I'm sorry, Dana," she says in a low tone of voice. "I thought, perhaps, you would want this case, that you would appreciate it not necessarily for the merits, but for other reasons. It's been a few weeks and I--"
"I'm doing fine, Monica." Scully lifts her chin defiantly. Reyes nods slowly. "Then you're convinced there's nothing worthwhile in the Hannigan case?" "No." Scully carefully places the mugs on a tray and leads the way back into the living room. She keeps her back turned to Reyes and Doggett as she places the tray on the coffee table; she knows without looking that Reyes' hand brushed the back of Doggett's head, that they sit next to each other close and comfortable. "Sometimes--" Scully turns to face them "-- there is indeed truth to Occam's Razor, that sometimes what you experience directly is indeed the answer you seek." Scully curls back into her arm chair, her hands warmed by the steaming mug she holds. In the pale glow cast by the lamps, her vision is fuzzy, and somehow the figures of Doggett and Reyes merge into one. She blinks, her heart beating quickly. "Dana?" Reyes looks at her oddly. Scully doesn't look at either Doggett or Reyes. Sometimes it surprises her that after sharing her most intimate moments and emotions with these two, she still feels the necessity of distance. She remembers Doggett's unwavering support while she searched for Mulder, and a part of her still aches when she recalls how he saw her embracing a miraculously resurrected Mulder; in that moment, she had been caught up her own joy, never thinking of Doggett might be waiting for her. When she merged from the hospital room later after Mulder had fallen asleep, Scully had found Doggett sitting outside. "You're still here," she said with some awe. "I thought I'd give you a ride home," Doggett said, standing up almost awkwardly. "That's assuming--"
She had meant to stay the night in the hospital on a cot in Mulder's room, but in that moment, Scully changed her mind. She knew what Doggett understood, that Scully and Mulder and their unborn child formed a triangle in which John Doggett had no place. She offered him a thin-lipped smile and nodded. "I'd appreciate that," Scully said softly. She looked up at Doggett. "Thank you." Her eyes had met his. Clear, unwavering, unflinching. Things would be different now, she wanted to say, and she wanted to tell him then that she appreciated all he'd done for her, had been grateful that he remained by her side, steady and reliable, during those long months without Mulder. She would never forget, she wanted to tell him. These were all things Scully knew she should tell Doggett, but somehow the words never came. And Reyes too. She had come on the scene later, but there was no doubt she was as integral and important as Doggett. And Scully knew she would forever be linked with this other woman, for she shared both the best and worst moments of her life with Reyes: the birth of her son and then the moment in which she'd let William go. It had been Reyes who'd spent those first few nights without William, sleeping on the sofa, somehow fitting her lanky long frame to Scully's small sofa. It had been Reyes who had carefully packed away William's things, Reyes who had brought dinner and distraction. One night, Scully calmly informed Reyes she no longer needed to stay the night. "I'll be fine," Scully said. She clutched the back of a chair for support. "Don't worry about me." Reyes looked uncertain, but Scully pushed on. "Thank you. For everything." Now, the sound of Doggett clearing his throat breaks through Scully's reverie. "We didn't mean to bother you, Dana." Doggett stands, and a second later, Reyes follows suit. Scully wants to ask them to stay, to keep talking, to keep the quiet at bay, but she recognizes that desire as selfish. And so she rises and walks them to the door. "Good night," Scully says, then, swallowing hard, she adds, "And I'm sorry." She doesn't elaborate. She shuts the door and walks to the window. By the glow of the streetlight, Scully can see them standing by the car -- Doggett's blue Ford Taurus -- and she watches Doggett open the door for Reyes, his hand slightly brushing against her shoulder before circling to the driver's side. Scully leans back against the wall, her hands pressed to her face. The nightmares came on and off for the first year or so after she'd been returned. Even now, there are still nights when she wakes to the sound of a drill in her ears. The pattern is the same. After the drill, she hears the hiss of air, and then there is sensation: an uncomfortable bloating in her abdomen. Finally, the lights, the bright lights, shining directly into her eyes. The voices, she can still hear the voices, indistinct and incoherent; where the sounds come from, she never can tell. As she lies, immobilized, she watches the shadows dance across the wall, very much aware that she is not lying in her own bed. In morning light, she never remembers how she comes home, how she's somehow managed to fight her way back, to *survive* even when the odds are against her. After such a night, as she finds her heart pounding, her breath low and shallow. There are the mornings when she fears the truth of her own memories, realizing some of them have been buoyed by the strength of Mulder's own beliefs. If all she has experienced, suffered and sacrificed is nothing more or less than a psychological delusion, then what is there left to believe in? What is left for *her*? And how can she even begin to make sense of the eight years her life ran parallel to Mulder's? Scully's high heels click out in steady rhythm as she makes her way to the basement office. Her heart beats a little faster, an almost eager anticipation; she has not been down here since she made the decision to give William up for adoption. Until now, she never realized just how comforting she finds the sterile cinder block walls or how much she missed the slightly musty and dank air. The door is slightly ajar and after rapping lightly, she enters. Even though she knows better, it still startles her to see Doggett sitting behind the desk, his sleeves rolled up. Even so, she has to smile because he reminded her of Mulder. She stands in the doorway for a second, feeling uneasy, even though for eight years she'd called this dark, dank basement home. "Agent Scully." Doggett rises to meet her, but she waves him down. "I hope I'm not bothering you," she says softly. "No, not at all. I was just reviewing some case notes." "I--" Scully pauses. "Can I sit down?" "This is your office," Doggett tells her. She is grateful for the reassurance. "It's been a long time." She hates how uncertain she sounds. "Things change." "Only if you want them to." She blinks. "I don't know what to say to that." Doggett shrugs, a smooth, fluid gesture. She likes the easy way he has about him, a little rough around the edges yes, but perhaps that's what makes it easier to work with him: that he is so clearly not Mulder. She takes a slow look around. There are still books everywhere, piles of paper, file folders, video tapes. She turns back to Doggett. "Have you had lunch, Dana?" he asks gently. "Yes," she says automatically. She takes the seat opposite the desk. How many times had she sat in this chair before, going through case files, watching videos and God, those slides shows, those never-ending slides of Mulder's. "I wanted to take another look at the Hannigan case." She is grateful for her crisp tone of voice, that returning edge of professionalism. An expression of surprise crosses Doggett's face. "You do?" "I may have overlooked something," Scully says evenly. "Please." Doggett pulls a file from the cabinet. He scans it quickly before handing it over. "I'll be interested in your analysis," he says. The file folder feels heavy -- but good -- in her hands; obviously, Doggett and Reyes have done some more investigating since the previous evening. Scully stands up. "Thank you," she says, looking directly at Doggett. "We'll get your proof," Doggett says. "Maybe not the Hannigan case, but we will find it. I promise." Scully clutches the folder tighter. "I'll call you tonight to discuss," she tells him. "I'm not making any promises though." She hears the hesitation in his voice and sees the softness at the corners of his lips, the unnatural gleam to his eyes. She realizes, for the first time since she let William go, she's in the company of the one person who understands the sad finality of that particular goodbye. She nearly chokes on her response. "Yes?" "It's good to have you back." Scully nods briefly, but doesn't look back as she leaves the basement office. When Liza asks her to lunch, she agrees to go. She doesn't say much, but she discovers -- much to her surprise -- that she likes listening to her colleagues talk about their children, their spouses; these are normal lives, she realizes, closer to fine than hers has ever been. For this reason she keeps her silence; the twists and turns in her own life defy even her own explanations. One day, she thinks, she'll tell them about Mulder, that he left her suddenly but she believes he still loves her. Perhaps she will ask them whether this knowledge still makes her his lover; after all, she has given up on Mulder coming home and somehow, this acceptance means the truth hurts a little less. And when she's ready, she'll tell them about William. She'll ask them whether she's still a mother even if she no longer has the child. She no longer pays attention to the silence at night. Instead, she spends most of her time thumbing through the case files Doggett and Reyes pass on to her for consulting purposes. Most of the so-called X-Files she can rationalize and she can almost hear Mulder in her head, asking her to give a case or rather give *him*, a chance. The memory of their arguments, his outlandish theories that she always contradicted with hard scientific facts, makes her smile and more importantly, a little less angry with him. She doesn't know what she's looking for in these case files -- unlike Mulder who began the X-Files with the purpose of discovering Samantha. Scully simply makes the assumption she'll know what she's found when she sees it. When she's out in the field with Doggett and Reyes, she doesn't think about what she has lost. She watches her partners, the way they walk shoulder to shoulder, and how they occasionally see only each other. She understands that kind of silent communication, but finds herself unable to tell them to take a chance, to not wait. She realizes Reyes and Doggett will have to find their own definition, just as she will have to discover hers.